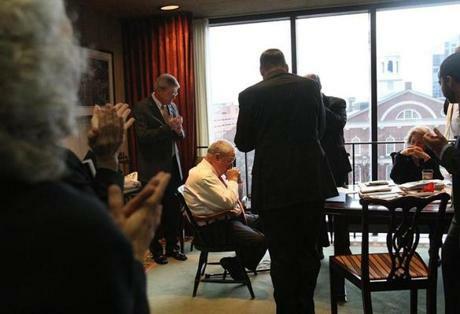 Mayor Thomas M. Menino let his staff know on March 28 that he will not seek reelection. 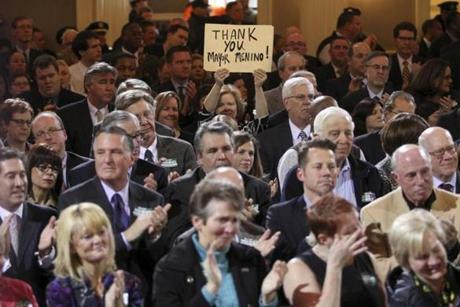 A sign in the crowd at Faneuil Hall as Mayor Thomas M. Menino announced that he will not seek reelection. 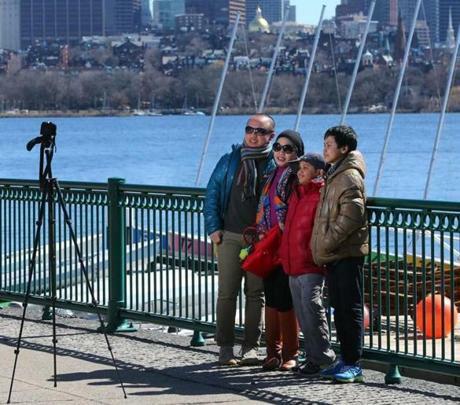 The Azis family from London took a self-portrait along the Charles River in Cambridge on March 27. From left are Mirza, Shinta, Alvito, and Farhan. 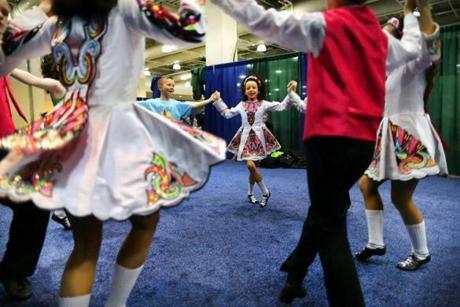 Dancers from the Peter Smith School of Irish Dance in New Jersey practiced their mixed under-13 ceili dance for The World Irish Dancing Championships being held at the Hynes Convention Center. It is only the second time in its 40-year history that the eight-day event was held outside Ireland and Scotland. Organizers expected 20,000 people from around the globe to attend. 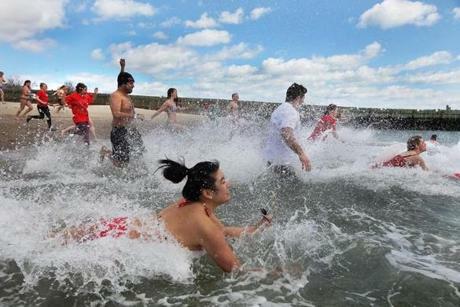 One hundred fifty participants leaped into the icy waters off the M Street Beach in South Boston on March 23. The Cupid Splash event, which featured some dressed in costumes, raised money for Save the Harbor and Save the Bay. 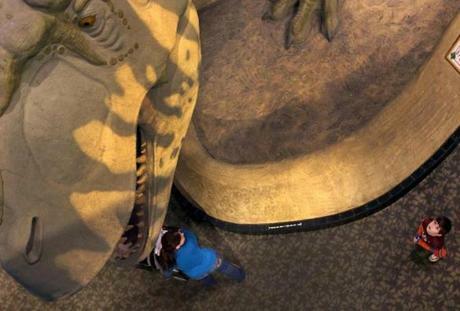 Visitors to the Museum of Science were dwarfed by the Tyrannosaurus rex exhibit on March 22. The museum held a series of events as part of its dinosaur weekend. 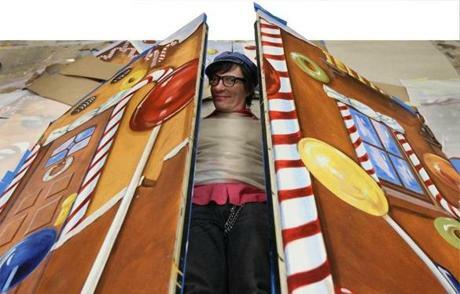 Playwright Ryan Landry posed with the gingerbread house scene piece on March 17 during a rehearsal of his play, "M," at the Huntington Theatre Company. “M” is an adaptation of Fritz Lang's 1931 movie thriller. Firefighters from all over the Boston area got instructions on March 26 from the Massachusetts Firefighting Academy on how to rappel. It was a four day event hosted by the Quincy Fire Department at a Quincy parking garage. Volunteers worked with homeowners, local businesses, and local and state agencies to assist in the clean up and repair of Plum Island beaches. 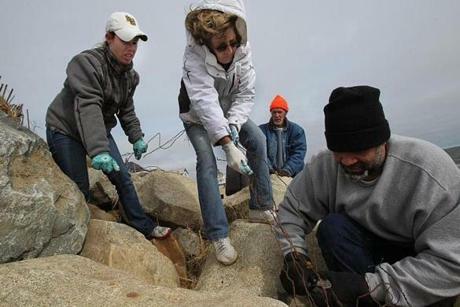 Working to clear beach rocks of barbed wire in foreground, from left, were mother and daughter Kim and Denise Maloney and Rafael Arce. It was pile-on time for the UMass Lowell Riverhawks as they celebrated their 1-0 win over Boston University in the Hockey East final at TD Garden. 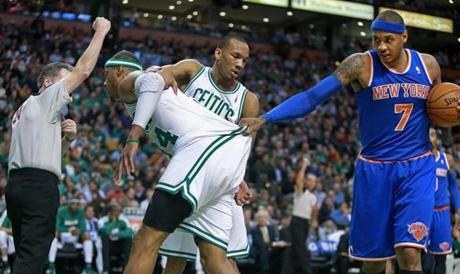 Two refs signaled a foul on the the Knicks’ Carmelo Anthony (7) as he held on to the uniform of the Celtics’ Paul Pierce, while teammate Avery Bradley helped keep him upright, during second quarter action at the TD Garden. Boston Bruins goalie Tuukka Rask couldn't stop the sudden death shootout goal by the Canadiens’ Brendan Gallagher.